I rarely find really awesome nail polishes to swatch from a main stream brand but oh MAN, I really like this one from OPI called My Voice Is a Little Norse. It was the holo - it was calling to me and I just HAD TO HAVE IT! 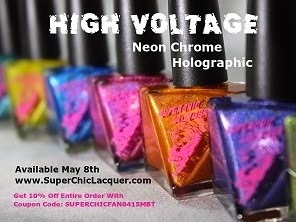 Speaking as an NPA (nail polish addict) who loves (loves, loves) holo, I couldn't actually pass this up when I saw it. I know, I literally have no self control, it's pretty awesome. lol! The holo dots are so epic!